Your Guide to everything Sushi. Get all of your Questions answered here! We know that getting answers to sushi questions can sometimes be a little difficult at times. And to be honest, it can get a little confusing for even the "connoisseur" too every once in a while. But hopefully it will be at times like those that we can be here for you to help clear things up. And who knows? Before long, you might be answering all of your friends questions too! Just know that you've come to the right place. You are home. For the ones just starting out, we have a sushi for beginners area just for you. And it is there that you can get some recommendations on what the best maki rolls or nigiri are to start out on if you've never had any before. You can also find out how to act when you get to the restaurant by learning a little about sushi bar etiquette. If you're more interested in making it yourself, then you can get advice on what the best recipes are to try if you've never made any at home before. And were not talking about just any recipes here either. These are ones that will assist you in hitting a home run on your first try by giving you a taste of the sushi making process while also building your confidence...one step at a time. In another area, we cover all of the different types of sushi so that you will know the difference between Nigiri, Maki, Chirashi, Inari, and Oshi. Then we will talk about what Sashimi is and why sashimi is not the same thing. And when you are done learning all of that and know what the different types are, you might actually start feeling confident enough to want to go out and eat it in a restaurant. But then you might think...wait a minute...don't they have like "rules" for eating this stuff in a restaurant? Yep...they sure do. But review a little about that on our sushi etiquette page and guess what? Let's say that you just went to a nice restaurant recently, and tried a maki roll that you think you might want to try to duplicate at home. No problem! Just head on over to our sushi recipes page and find that recipe. No recipe for that one you say? (maybe it is a specialty roll made just at that particular restaurant?). Well then. Just follow our advice for identifying the type of roll it is by its size (diameter), the type and number of ingredients that are in it, match it to the proper "generic" roll and then follow our recipe for building that roll whether that is a hosomaki, chumaki, futomaki, uramaki or temaki roll. Ta da! You just figured out and created a roll you wanted to duplicate...on your own! Talk about empowerment! You gotta love it. What is that? So you don't want to roll your sushi with an old fashioned sushi mat (makisu) or form your nigiri by hand you say? No problem! We also cover the hottest sushi making kits for you. And we don't leave you hanging by just covering the recipes. We'll cover the stuff that you need to actually make them with too. The supplies and ingredients. For instance, what if you are wanting some background on some of the sushi ingredients in the recipes (like sushi grade fish, rice vinegar, wasabi or ginger)? We got you covered. Or maybe you want some info on some sushi supplies and equipment you might be needing like rice cookers, sashimi knives, rolling mats or even a hangiri (rice mixing tub). We got that here too. So you see? We got your back on this. But at this point, you might be starting to wonder a little about me, why I am doing this, and what my background and experience is in this area. I remember watching my mother put hot, steaming white rice in a hangiri (wooden rice mixing tub), followed immediately by a measured pouring of a rice vinegar, sugar, and salt mixture. Then she would "toss" it with a rice paddle while at the same time fanning it to cool it off. When the mixture had cooled, she would either form little pads of rice that would get a swipe of wasabi on top of them before getting draped over with her favorite topping or she would make maki rolls with it. That "old school" way of making it is seared into my brain. Of course, now you can buy an instant mix in a packet to simplify the process. But does it taste as good as the old school method? (Mom says "No"...but we'll conduct our own "test" soon enough and then you can vote on it...). And that's exactly the kind of stuff we will talk about and discuss on here. 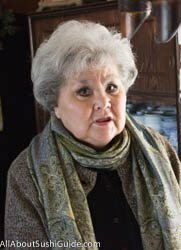 So you see, a lot of the information that you will find on this website will reflect what I learned from my now 80 year old Japanese mother (who I was in active consultation with during this process I might add :-) who learned it from her mother way back in the 1930's and 1940's. The end result is that we have on this website the same old school, traditional, at home Japanese cooking and preparation methods used by my mother during her lifetime that are now being passed on to you by way of her recipes, tips and advice. I hope that this is the kind of information that you are looking for. Because if it is, it will be my pleasure to be your guide and provide you with all of the information that I can on the subject. But also with your help, input, and advice, we will make this site Rock! 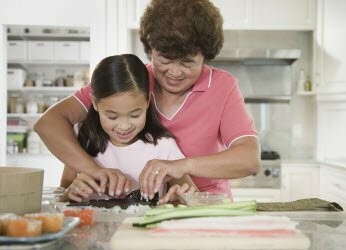 Sushi Recipes from "How to make sushi rice" to "How to make sushi rolls" and everything in between...this is your one stop shop for every recipe! Get the Top Ten Sushi Ingredients you must have to make Good Sushi at Home. Including explanations and history. Sushi Supplies guaranteed to improve your Homemade Sushi by making it either easier, more convenient, or more consistent! Learn what Sushi Making Kits are available, which are the best and which one is the right one for You! Get the History of Sushi - All the way back to the 4th century B.C. Interested in what the History of Sushi is? Where it came from? It's Origins? Why they started eating meat raw? Why they started adding Vinegar to the Rice? You can know the answer! Sushi for Beginners needn't be confusing or difficult to understand. Learn about it in a simple, straighforward way -- without all of the Fancy Talk. Sushi for Dummies|A Little Slow on the Sushi Low Down? Get the Answers here. Whether you're looking for a Crash Course in Sushi for Dummies or you're looking for a Review of the book, You've found the right place! Sushi Nutrition. Are there health benefits associated with eating Sushi? Sushi Nutrition is a question on a lot of peoples minds. It is a very popular form of food in Japan and the U.S. But is Sushi healthy? Let's find out. 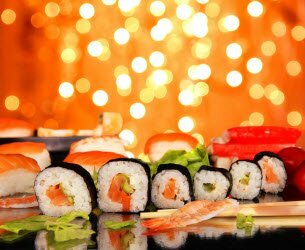 Sushi safety is something you should know about if you eat sushi on a regular basis. Find out about sushi grade fish, sushi and pregnancy and is supermarket sushi safe? Upload and Share your Sushi Photos with our AllAboutSushiGuide Audience! Post Pics and a Description of your Favorite Sushi Restaurants here and Tell the World! Get started in this program and join for Free. Sushi the Beginners Guide Book Review | Is this a Good Book on Sushi?